Dreams often communicate through their own language of symbolism and metaphors. While it is possible to have literal or pre-cognitive dreams, more commonly a dream is an extension of our consciousness speaking to us in this language to raise awareness in waking life. Understanding the language of dreams will help you to recognize symbols and metaphors in dreams. ￼A metaphor is defined as a figure of speech in which a word or phrase is applied to an object or action to which it is not literal. Metaphors often occur in dreams due to the way our minds make associations. Example: We are falling in love. We often say we "fall" in love...but there is not physical action of actually falling. This is a metaphor. If we literally fell in love, we would have had to have tripped and landed in our partner's arms! You do not physically “fall” in love - yet this is a very common metaphor we use all the time. In a dream, you may dream of falling and it is a metaphor for something else completely different. Symbolism is defined as the use of a person, object or event to represent associations of ideas or qualities. Example: A clock is a symbol for time. In the case of symbols in dreams, we need to think about the details of the clock in the dream as well as the context in the dream. Doing this will reveal more about the meaning. While a clock may in general be a symbol for time, it could mean a number of things: a looming deadline, feeling rushed, having an important appointment, being aware of the present moment - there are a lot of meanings for clocks in dreams! Learning to identify symbolism and metaphors in dreams can deepen your understanding of communication with your consciousness. It is pretty easy to recognize different symbols and metaphors in our dreams. Ask yourself these questions below to help you find what symbols are present in your dreams. What stands out the most to you about the dream? What can you describe with great detail? The more details you can provide about an element in the dream, the more it suggests it is an important symbol. Pay attention to the language and words you chose to describe the details of the dream – this is also important. What repeating elements are in the dream? Symbols often recur more than once in a dream. You will likely notice some interesting patterns that emerge in the dream. Note recurring characteristics and concepts. Example: You dream of birds, then dream of flying in an airplane. What is the overall theme or concept of the dream? Try to summarize the theme of the dream with one sentence. 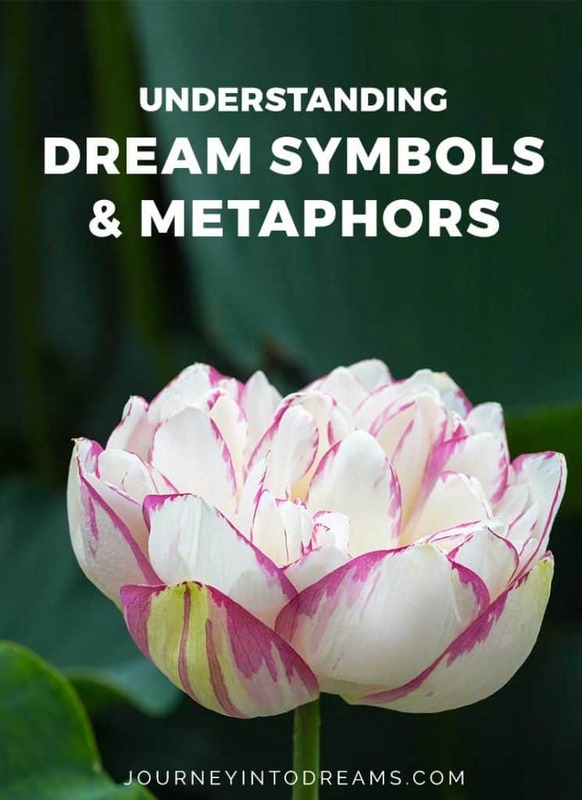 Identifying a theme or concept not only confirms the element of the dream is indeed symbolic in nature, but also provides insight on the meaning of the symbol as well. Example: Dreaming of an empty refrigerator. Theme/Concept: Not having nourishment, hunger. One of the easiest ways to identify what symbols and metaphors might be present in your dreams is to go through what you have written in your dream journal. Underline any objects, people, events, or actions that stand out to you. Not using a dream journal yet? Learn how to create one! Then it is very easy to learn how to write down your dreams for interpretation! Often times, these things can help you see a recurring pattern and theme. When you combine these elements and look at your whole dream as a story, the pieces of the puzzle start to really come together. This is when you can start understanding what the dream might mean and start applying the wisdom in your daily waking life. You can start making your own symbol associations in dreams, or if you find yourself curious about what a symbol means you can always look it up in our dream dictionary. Do you have any thoughts on metaphors and symbols in dreams? Share your comments in the section below!